The University of New Brunswick announced today that Allen Curry of its Canadian Rivers Institute has been awarded $2.8 million from the Natural Sciences and Engineering Research Council (NSERC) to conduct an aquatic ecosystem study on the St. John River to support NB Power’s future decision on the Mactaquac Generating Station. This is the largest Collaborative Research and Development Grant ever awarded in Atlantic Canada, bringing the project total to $5.3 million, and will have a significant impact on the province. The Mactaquac Generating Station is expected to reach the end of its service life by 2030 due to problems with concrete expansion in some of the structures. NB Power is examining how future options might impact people and the environment, along with engineering, economic and scientific considerations, and will choose a path forward in 2016. Under the leadership of Dr. Curry, a team began evaluating key environmental challenges related to Mactaquac’s future back in 2013, including river health, fish passage and flow management. That work is being supported by a $2.3 million investment from NB Power. "Our government has made record commitments to science, technology and innovation to the social and economic benefit of Canadians,” said Keith Ashfield, Member of Parliament for Fredericton. “This funding will help Dr. Allen Curry and the Canadian Rivers Institute continue their leading research and will benefit the entire St. John River Valley for many years to come." This NSERC funding will allow the team to conduct an aquatic ecosystem study through a series of projects that will provide a better understanding of how the river works, which will allow for informed decision-making. Established in 2001, the Canadian Rivers Institute is the first institute of its kind in the world and has established itself as an international leader in the field of river science. 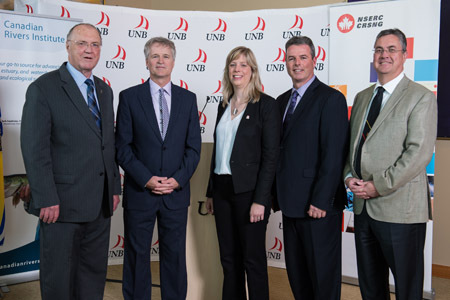 With a collaboration of researchers at the University of New Brunswick Fredericton and Saint John campus that has expanded to a network across Canada and globally, the mandate of the CRI is to develop the aquatic science needed to understand, protect, and sustain water resources for the region, nation, and the planet.